Sometimes great recipes are deceptively simple. A while back I was watching a re-run of Top Chef Masters and during one of the challenges, chef Naomi Pomeroy made this delightful looking salad. There was thinly sliced asparagus, toasted bread and a dressing made with lemon but I wasn't sure about the rest. A quick online search, however, produced the recipe. I should mention that the challenge had something to do with having a tiny budget and only minimal ingredients because I image that Chef Pomeroy would have made the recipe a bit more elaborate in her own restaurant. Since I wasn't under any sort of constraints, I took the liberty of adding a few things that I think complimented the dish. For example, Chef Pomeroy didn't use any cheese but, where salads are concerned, I think a little crumbled feta never hurt anything. I also used a bit less oil and creamed up the dressing to suit our taste. All in all, this "simple" salad ended up having amazingly complex flavors and was a fun and delicious play on a panzanella. Enjoy! Place the bread cubes on a baking sheet, spray with non-stick cooking spray and bake in a pre-heated 400 degree oven for 10 minutes. Add one tablespoon of the olive oil to a pan and, on low heat, saute the shallot and garlic until tender and translucent. Add the tomatoes and continue sauteing until they have broken down a bit. You can also mash them down a bit with a fork. In a bowl, make the dressing by whisking together the remaining tablespoon of olive oil, lemon juice, mayonnaise and herbs. Add the sliced asparagus and the sauteed onion and tomato mixture. Mix in the croutons and allow the salad to sit for about 20 minutes so that the bread can absorb the dressing. Season to taste and toss in the cheese. Makes 2 servings. This looks so good. I've always been meaning to try panzanella, or something like it. So simple, but so delicious looking. Oh, this looks great. 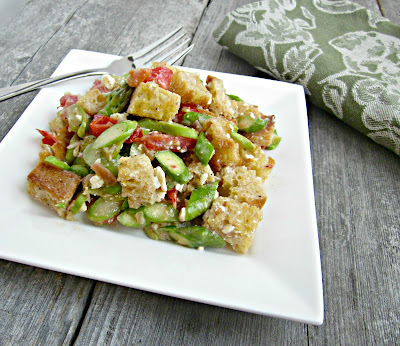 I love panznella salad, this is a delicious twist with the asparagus. I love panzanella! This is a fabulous variation on the same ol', same ol'! YUM! This looks so good! I'm a big fan of anything asparagus! I love this recipe and your variations!!! Yep. That season was a pretty good one. I'm looking forward to the upcoming one too. Will you be watching when it premiers tomorrow night? Wow this is my kind of meal lovely photo as well great salad! this looks amazing! i'm instantly obsessed with this salad; it literally has everything i love inside. and that it's a bread salad (a personal favorite type of mine) doesn't hurt either. :) thanks for sharing this! Such a good idea! I love the asparagus in the bread salad, I've never seen that before, it looks delicious! Stunning pics too, your salad's gorgeous! Such a good idea! this looks amazing! I'm always looking for a new and interesting salad and this sounds terrific. Happy that I stopped by today. such a great salad! i love the asparagus in this! This is so fabulous. Love it to bits. What a gorgeous salad! Wholesome and delicious! This looks like a fun recipe to make. I'll be giving this a try for sure!